Your Premium Security Partner 24 Hour Monitoring & Armed Response - Alarm Installation & Repair - Electric Fencing & Access Control - Security Consulting & Special Events. Need an alarm system? We source local suppliers where appropriate to keep costs low and always install the highest quality, most reliable system. We are SAIDSA approved installers of security systems, CCTV cameras and Electric fencing. Unlike other security firms, we do not make the use of sub-contractors, but have our own in-house security teams. We pride ourselves on our fast response time. Our state-of-the-art 24 hour, SAIDSA approved control centre never sleeps so that you can. 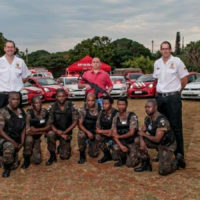 We have the largest fleet of SAIDSA approved armed reaction vehicles in the Ballito / Salt Rock area and intimate knowledge of the greater North Coast area. We provide dedicated, highly-trained personnel for when you need some extra protection.